The Church of St Matthew and Saint James, more generally known as Mossley Hill Church, was consecrated on 23 June 1875. The Church’s names were that of its founder Matthew James Glenton, a friend of William Ewart. 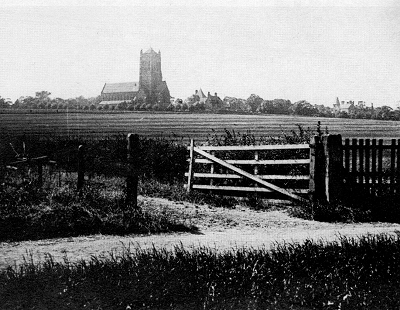 In the 1830s he had stood at the corner of Rose Lane and Mossley Hill Road and admired the outlook, commenting to his friend as to the possibilties of that spot as a site for the Church. Glenton moved South but on his death in 1871 the bulk of his fortune was left for the building of a Church on the spot where it stands today. Michael O’Mahoney, in his “Liverpool Ways and Byeways” says of the Church that “it has one of the finest church sites in the kingdom…the great church – I might almost say minster – rises in majesty above you”. It was difficult to justify the building of a church where the population was so small and St. Anne’s was at the bottom of the hill. However, the men of wealth and power who lived in and around (North) Mossley Hill Road were not to be refused their own church at a bargain price. Despite the objections of the neighbouring parishes from which the new parish would be carved the Bishop of Chester gave his approval and the Building Committee got to work. The composition of the committee reflects the nature of the society created by the arrival of the railway – two cotton brokers, two stockbrokers, one merchant and one manufacturer. Externally, although it was the first church in England to be bombed during the Second World War, it has changed little since its consecration in 1875. According to the Chief Constables listing of the air raids on Liverpool it was the 28th and 29th of August 1940 when the raid took place which damaged the church between 23.50 p.m and 4.20 a.m. In 1922 the Ritchie Chapel was added at the north-eastern corner and in 1975 a new church room was added at the south-western corner. The stained glass windows which had been shattered by blast were replaced by clear glass and two glorious stained glass windows, the work of Karl Edwards, were installed at the East and West ends. In Mee’s “Lancashire” the church is described in these words, “The base of the tower forms a choir and the lofty arcades lead to it like an avenue. There is rich carving in the oak stalls, on the pulpit and on the alabaster font. On the canopied reredos is a coloured carving of the Upper Room in Emmaus (a copy of a glass mosaic in Westminster Abbey)”.